The mighty Greek Minotaur, part bull and part man, born of woman and bull with the body of a man and the head of bull that resided on the island of Crete in Greece. A fearsome sight the Minotaur was both strong and aggressive, who lived deep within a secret labyrinth, built by the architect and inventor Daedalus. The Minotaur was hidden from sight, contained in the maze that only its create inceptor Deadalus, knew the intricate layout and structure of. Housed in his maze, the Minotaur was an outcast from the Cretians*, born in sin, and forced to be kept hidden, the Minotaur would feast on the flesh of humans sacrifices provided by its keeper King Minos of Crete. The horrible secret of the Minotaur birth was of significant important to King Minos, he needed to keep the beast a secret to protect the Minotaur’s mother, Queen Pasiphae, the wife no less of King Minos. With the shamed history of the of the Minotaur’s birth, the myth and secrecy surrounding his existence, and his fearsome appearance, and his penchant for human flesh the Minotaur was destined to be one of the most popular Greek mythical creatures. 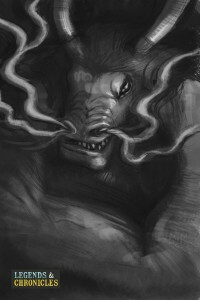 The appearance of the Minotaur was a blend of human and bull, the focal point of the might beast was of course the bull head which led into a human torso. The Minotaur’s neck was obviously larger than that of a normal man, large enough to support the size and weight of the bull head. Heavily muscled the Minotaur was a formidable foe for anyone, with more muscle mass and size than an ordinary man, the Minotaur was reported to be well over six feet tall. The final defining mark of the Minotaur was the bull tail, which many said allowed the Minotaur exceptional balance and poise. When King Minos of Crete was in a power struggle with his siblings for the throne, he made a prayer to the powerful Greek God of the sea Posideon to bless him with a rare white bull, to show their favour for him. When Poseidon granted the wish and the majestic while bull walked forth from sea, Minos decided he should slay the rest of his bull herd and keep only the special white bull. Poseidon did not approve of this, and in turn cast a spell on King Minos wife, Queen Pasiphae, and forced her to fall in love with the bull. In turn Pasiphae with her love so strong for the bull turned to the inventor Deadalus to help her make love to the bull. Deadalus in his duty constructed a wooden cow body, for the Queen to lie in and the bull would make love too. So with Queen Pasiphae pregnant, and of course when King Minos became aware of this decided there was only one option but to keep the birth hidden and the offspring hidden forever. Again Deadalus was called forth to repent his past sin in the conception, and instructed to create a complex and deep labyrinth which would allow Pasiphae to give birth to the Minotaur. Here in the labyrinth on Crete, the Minotaur would live in secret, King Minos forced to feed the beast, would look for fourteen youths every few years to offer as a sacrifice to the beast. Anyone that was put into the labyrinth would never return, and the Minotaur lived on. Later Deadalus would implore King Minos to let him leave Crete, however the King feared that Deadalus would let the hidden secret of the Minotaur and the labyrinth loose. Deadauls was imprisoned by the King and with no escape he would construct wings for him and his son Icarus to escape Crete. When word of the next sacrifice was due for the Minotaur, a hero by the name of Theseus planned to end the sacrifices and slay the Minotaur. Theseus took the place of one of the sacrificial youths, that was to be fed to the Minotaur, and entered the labyrinth. With the help of Kind Minos daughter who Theseus had fallen in love with, the hero was able to overcome the might Minotaur with his strength and fighting skill, and able to end the sacrifices. Thus the Minotaur was nor more, the mythological beast had been slain.